For most companies, Microsoft Active Directory (AD) plays the central role in coordinating identity and access management policies. AD typically serves as a “source of truth” for user identities, and it provides access control to on-premises resources such as networks, file servers, and web applications. A byproduct of the transition to cloud applications is the proliferation of separate user stores; each cloud application typically is rolled out independently and therefore has its own unique database of user credentials. Okta’s cloud-based identity and access management service solves these problems with a single integration point that provides a highly available solution for all cloud and web-based application AD integrations. 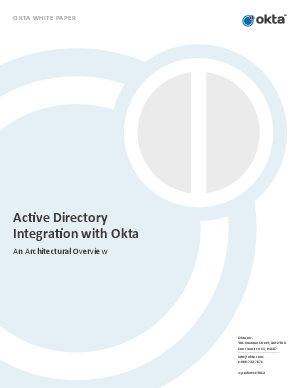 Read this whitepaper to learn how Okta eliminates the pitfalls that come with trying to build and manage multiple on premises AD integrations yourself.